← The New NRA Ad: Your Thoughts? Right about now you should start feeling like a Twitter rockstar: you can tweet, retweet, favorite, follow….heck you can do just about everything. So where do you go from here? It’s time to start putting these skills to use: let’s get you some followers! 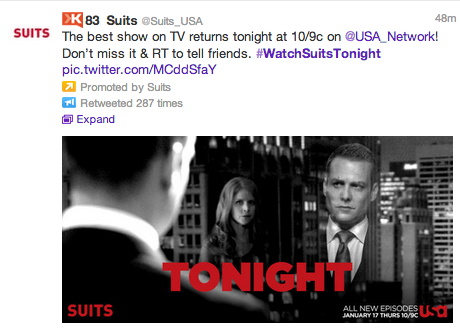 If you notice the first hashtag, it says that it is promoted, meaning that Suits has paid for this hashtag to appear first (to coordinate with their episode release in this case). 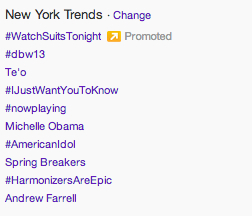 A great way to get on people’s radar is to interact with ‘trending’ or highly popular tweets. That being said be extremely careful when interacting with trending topics, and make sure you always ALWAYS research WHY it is trending (heaven forbid you should accidentally get in trouble, or align two hashtags incorrectly like Kmart). In cases politically sensitive like the Obamas, try to remain neutral…even if you have strong opinions: It’s better to play safe than get burned. In cases like the Te’o tag, this refers to a news story about his alleged ‘fake girlfriend’ scandal. As a new Twitter, steer clear of that topic until everything is confirmed. In this case, the safest tag to interact with is the promoted tag, so let’s try that. Interestingly enough, this person has tweeted more than Chanel, and follows more people than both Caudalie and Chanel combined. But does it pay off? Interestingly enough, despite having more followers than Chanel, and tweeting more often than both Chanel and Caudalie, Mark Cuban does not have as much influence. Much of this has to do with what he tweets, who he tweets it at, and who he chooses to follow. When you decide who to follow, always make sure you are following only people with more followers than people they follow. This will help you get an edge on gaining influence. Another tip: try to keep your follower count higher than your ‘following’ count by at least 10 people. This should help you gain more influence. Let’s move on to the most important aspect of Twitter accounts: relevancy. To stay relevant, make sure you interact with hashtags that are relevant and interesting to you. Don’t hop on a bandwagon trending hashtag because its ‘what everyone else is doing’; if you think it’s cool, do it. If not, don’t. Similarly, don’t just follow a ton of people you think might follow you back: just because I follow Mark Cuban and Barbara Corcoran doesn’t mean you should if you aren’t interested in business and investment. If you are fascinated by female comedians, follow Kathy Griffin or Ellen Degeneres instead. Everything you do on Twitter is essentially governed by relevancy, and the more you interact with users with interests similar to yours, the better. To do this, search for hashtags in topics you like, such as #women or #innovation and see what conversations you can join. How to Spot a Spammer! Absolutely! I love when people ask for specific topics! I will totally get to work on mobile tweeting…the images might be a little less pretty since I can’t screenshot from a phone…but i’ll do my best…heck would a video be easier for that?